We are still struggling with food sensitivities, allergies and just health problems in general so I’ve been trying to come up with more dishes that we can all eat together. Both my husband and son are not fans of vegetables, so about 95% of everything you see here is not something they want to see on their plates. I get frustrated some days accommodating three different palates, and now that we’ve added food allergies, it’s downright dismal planning dinner. In a perfect world, we would all eat the same thing, consume whole unprocessed foods and eat for our health. In reality, not so much. I want to be honest with you all and say that my diet is not perfect and I am always trying to find a balance in what I eat. Sugar is a huge problem for us, as in we can never get enough. These days if I’m going to consume it, I try to at least prepare it myself so I can control the ingredients but my boys live for candy, and sugary treats. I think if I presented a meal of brownies, ice cream and milkshakes the only question I would get is why have I waited so long to come up with this idea? If I can’t get them to give up sugar, I can at least try to get them to eat a few vegetables, something else they aren’t really fond of. I know that I haven’t really jumped on the zoodle bandwagon much but I do own a Paderno Spiralizer and I do use it quite often. One of my favorite all time recipes includes vegetable noodles but I must admit I haven’t played with it much until now. There are a ton of different models on the market but I’ve been really happy with the Paderno and it will only set you back about $30.00. I will start by saying that I don’t like to buy a ton of kitchen gadgets with limited uses. Asparagus steamers, mini pie makers, corn strippers, avocado slicers, I just don’t have room in my kitchen for things that only have one use. But I’m finding that my spiralizer does indeed deserve a space on my shelves and it makes it easy to have a ton of vegetables and cut my prep time in half. 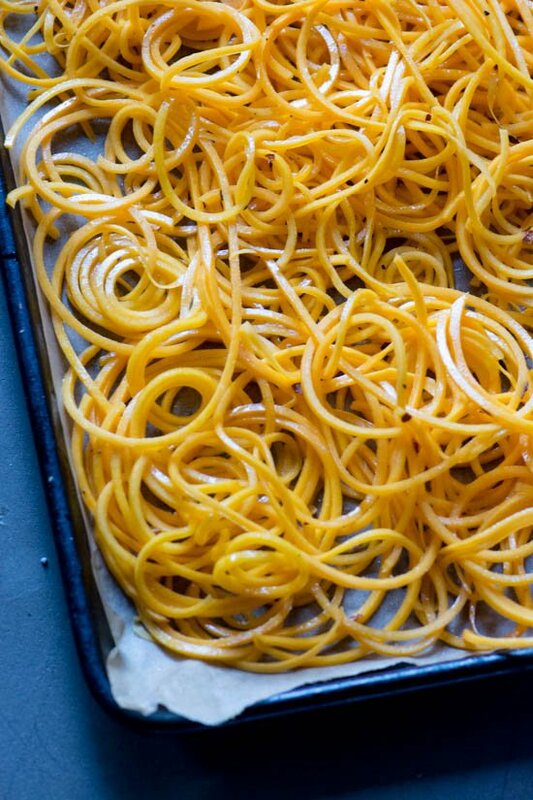 I have an old recipe that I realized I never shared with you all and it occurred to me that it was the perfect opportunity to convert it using the spiralizer. 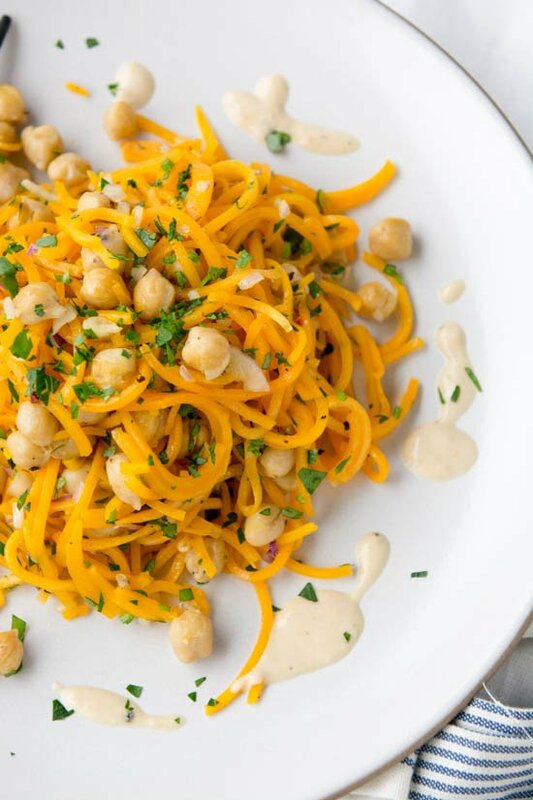 These butternut squash noodles with tahini sauce are the perfect way to introduce yourself to the world of spiralized vegetables. I usually roast the butternut for 20-25 minutes and then toss it with the dressing and serve it as a salad but I have to say that I really preferred it this way. It only takes 7 minutes to roast the noodles so this dish went from a prep and cook time of 60 minutes to less than 30 minutes from start to finish. While the noodles roast, you prep the dressing and parsley and then toss the whole thing together. 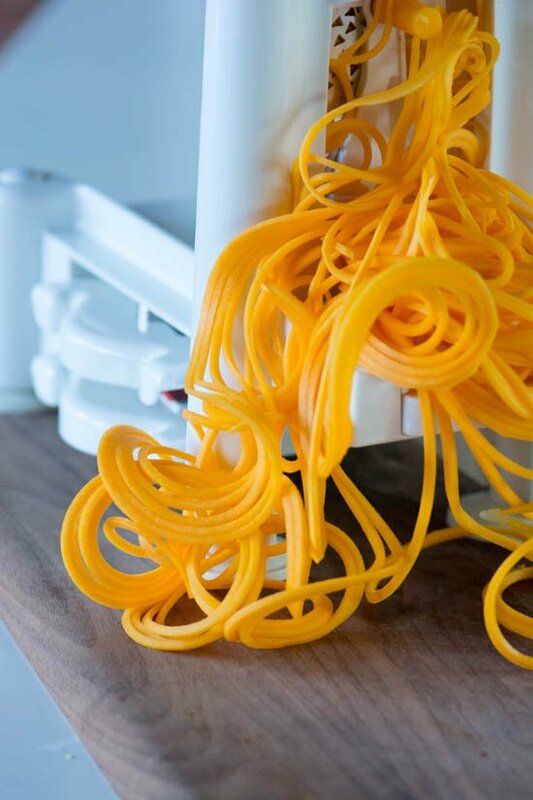 What are your favorite ways to use your spiralizer? I’d love to hear your thoughts or suggestions for recipes you’d like to see, especially as we approach the holiday season. I’d love to hear your thoughts and how it turned out for you! Leave a comment or share a picture on Instagram with the hashtag #scalingback! Vegan pasta has never tasted so good. 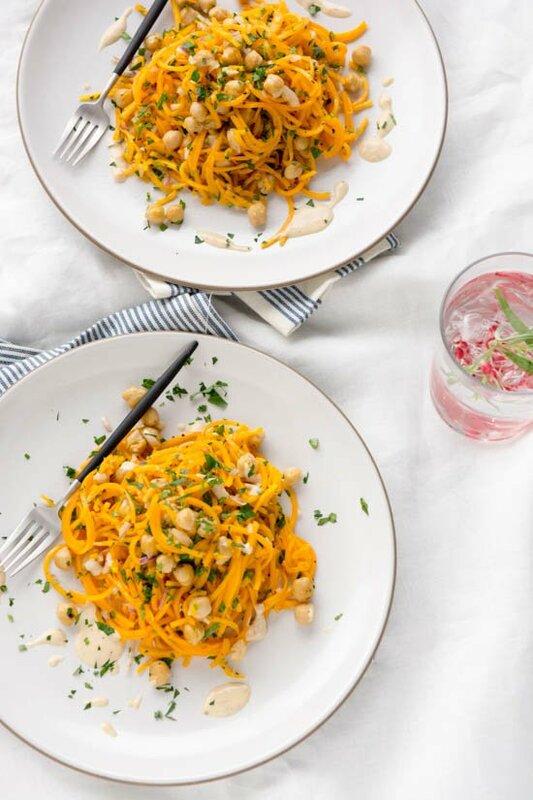 Sweet butternut squash noodles are tossed with a creamy, salty, delicious miso tahini sauce. Super easy to put together and the leftovers are good warm or cold! 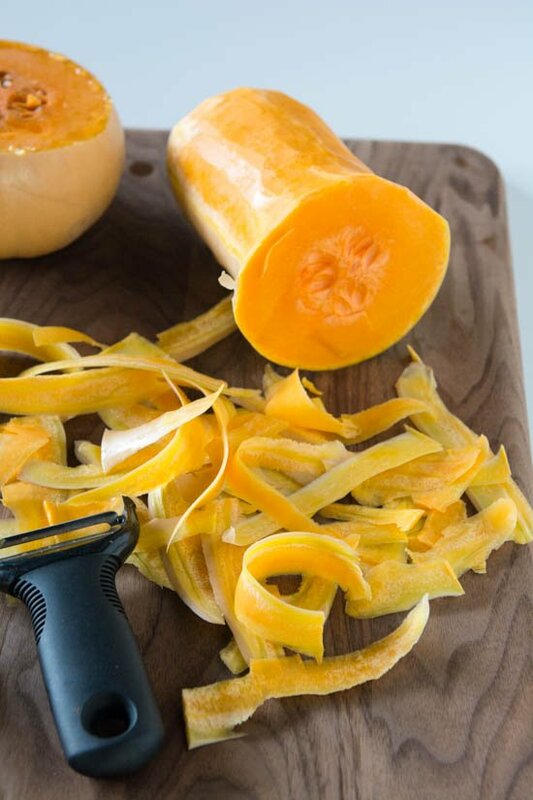 To spiralize the butternut squash, peel the skin off until you see the bright orange flesh. Cut the bulbous bottom of the squash off where the seeds are and set aside. 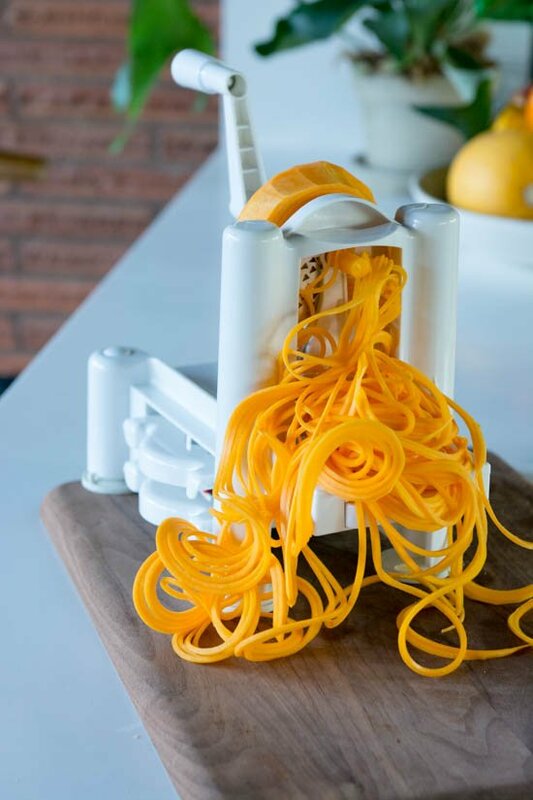 Cut the remaining squash into two pieces and load into the spiralizer according to your machines directions and spiralize the butternut squash. Line two baking sheets with parchment paper. Combine the squash with one tablespoon of olive oil and the red pepper flakes and toss well to combine. On the other sheet toss the remaining teaspoon of olive oil with the garbanzo beans and season with salt and pepper. 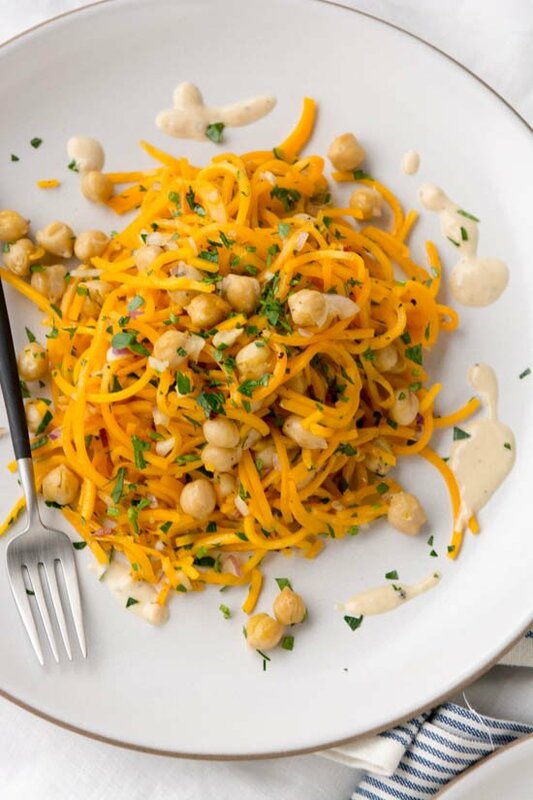 Roast the squash and the chickpeas for 7 minutes or until the noodles have softened slightly but are not mushy. 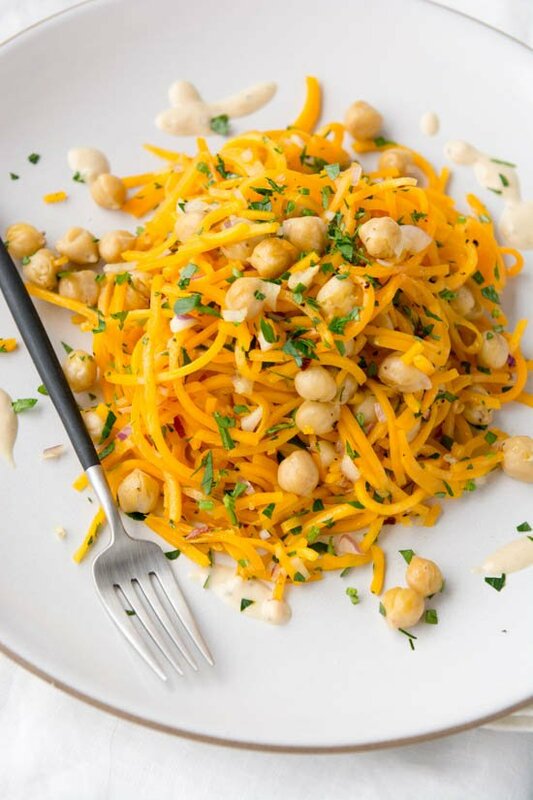 While the squash is roasting grate the garlic into a small bowl using a microplane or finely dice the garlic with a pinch of salt to help break it down. Add the tahini, water, olive oil, lemon juice and miso and whisk well to combine. You can add a little bit more water to thin the dressing if needed. 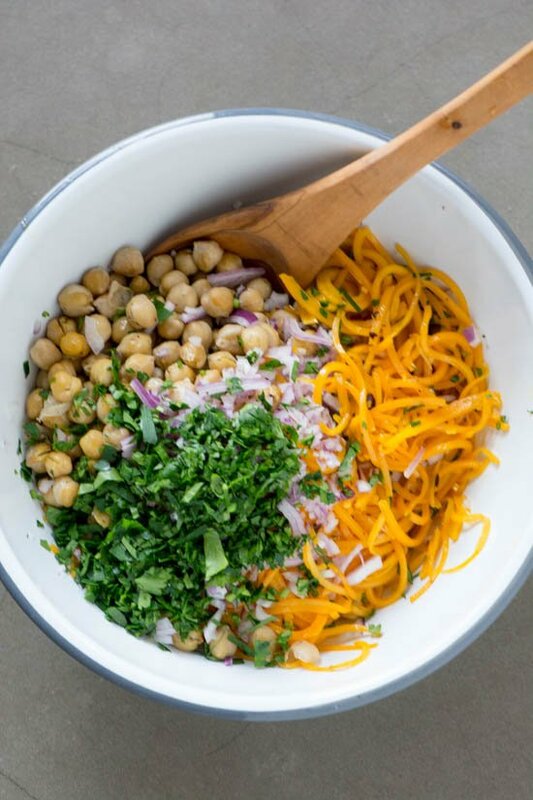 In a large bowl combine the roasted squash, chickpeas, onion and parsley and toss well. You can pour the dressing over the top and mix or serve it on the side. 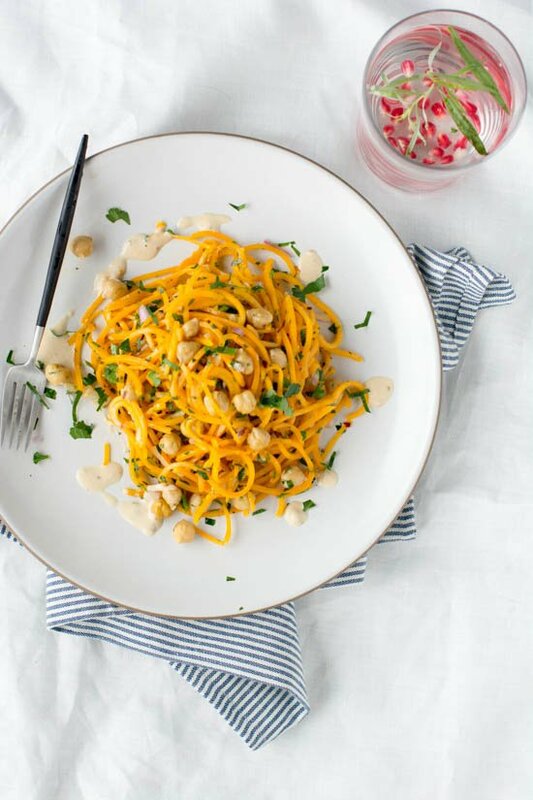 These noodles look fantastic and healthy! 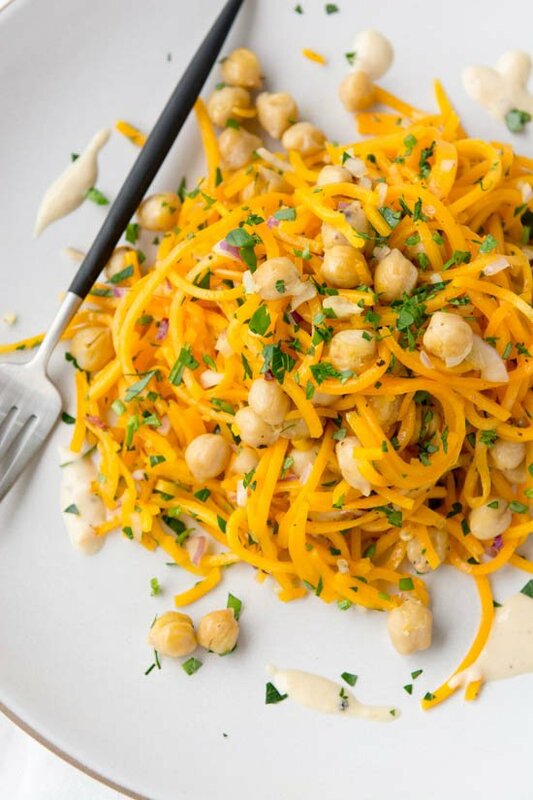 I have been meaning to get a spiralizer, and the information is just the encouragement I need to do it. With a small kitchen, I have learned to scale down on my accessories, but some things are good to have. Thank you! I was on the fence for a long time about investing in one. But it does make getting a healthy, easy dinner on the table much quicker! I hope you find it’s worth a space in your kitchen collection.